Rob Cesternino and Akiva Wienerkur stocked up on Beef-a-Reeno so they could bring you another Seinfeld Post Show Recap. 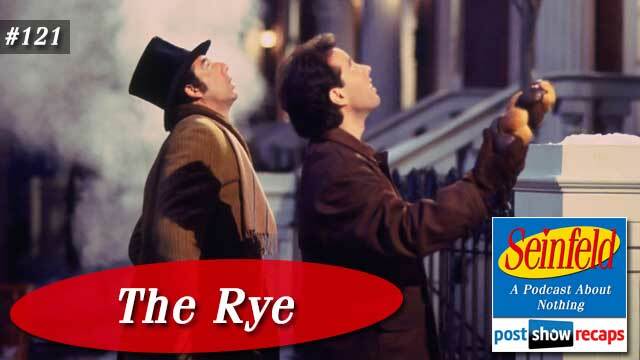 This week they break down “The Rye” which first aired January 4, 1996 as part of season seven. The episode was written by Carol Leifer, who would leave the show soon after. News – Rob shared how they interviewed Jennifer Armstrong, writer of the book Seinfeldia, which you can find in Post Show Recaps much like any other Seinfeldrecap podcast. In lieu of news, Akiva decided to go on a rant instead. He was kicked out of Rob‘s 20 team Fantasy Football League for being one of the bottom teams. Rob offered to let Keev co-own his team. Jerry’s Story – Jerry doesn’t have a main storyline this episode, but he does have a hand in George’s adventure with the rye. He comes up with a plan for George to get a marble rye to replace the one Frank stole. He suggested to have the Rosses go with Kramer on the handsome cab ride, and George can go up to the apartment and replace it. Jerry went to the bakery to get it, but they were sold out. He notices an elderly lady just purchased the last one, so he offers to buy it from her. When she refuses, he wrestles it away from her, calling her an old bag in the process. Elaine’s Story – Elaine has started dating a jazz musician, but she is not fully impressed with his ambitions in the bedroom. She becomes worried about the relationship when Jerry tells her one of John’s backup performers called them “hot and heavy”. But when John writes a new song called “Hot and Heavy”, she thinks it a good thing. After sharing with John how she’d like him to try some more selfless things in the bedroom, he agrees. But after a long afternoon tryst, John can’t play the saxophone properly, effectively ruining his set, and the relationship. George’s Story – George is getting ready with his parents to have dinner with the Rosses. Frank wants to stop at the bakery and get a nice marble rye to show the Rosses how classy they are. At the dinner, both sets of parents make things uncomfortable with their fighting, and strange conversation topics. On the way home, Estelle and Frank complained about the dinner, and Frank revealed he stole back the rye bread after the Rosses didn’t serve it. Jerry helps George concoct a plan to get the Rosses out of their apartment by having Kramer take them on the handsome cab ride so George could replace the rye. When the horse’s flatulence ends the ride early, George has to come up with another plan, so he gets a fishing rod and has Jerry attach it to the rye. After he hauls it up, he turns around to see Susan and the Rosses watching him the whole time. Kramer’s Story – Kramer starts off the episode with a gigantic haul of food from Price Club. He bumps into a friend who happens to play backup to Elaine’s new boyfriend John, and tells him that Elaine and John are really “hot and heavy”. Later on, he runs into a neighbor who asks Kramer to operate his handsome cab ride while he is on vacation. In an effort to get rid of some of the bulk food he bought, he feeds it to the horse. While taking the Rosses out on ride, Rusty the horse ends up with gas so bad that the ride has to be cut short. Tangents – Both Rob and Akiva aren’t huge fans of buying in bulk, feeling that most of the purchases are of things they don’t need. Akiva thought that rye bread isn’t great, but it’s fine, while Rob solved the mystery of what makes a marble rye different than regular rye. Rob talked about how contestants on Survivor tend to give a lot of thought to the mating habits of fowl, much like Frank Costanza. Rob thought it strange that George would go home with his parents when he lives with Susan. Rob shared how he has never had Chef Boy-R-D, based on his Italian parents feeling it would be sacrilege. Grades and Rankings – Elaine earned an A-, with the guys applauding the show for talking about a subject matter not discussed much back in 1996. Kramer earned an A, with it being considered a top five storyline. George and Jerry also earned As. While it didn’t make the top 9, Akiva thought it deserved a ranking of 37, while Rob thought it was definitely top 9. Emails – Johnny De Silveira asked if they remember meeting their in-laws. Both remembered it well. Lindsay asked if they too overbuy at Costco. Akiva definitely does, while Rob‘s freezer has no room due to too much milk reserve for the baby. Jiff noted that Jerry should have been happy that Kramer bought all that food for himself. Craig emailed in to share how Mabel was the first witness against the gang in the finale. Brent wondered if stealing the rye bread was the most out of character act, but Rob thought it was right in line with Jerry’s true self, and not out of the question for any of the four to have done it. Jeff asked why George didn’t use Susan to get the rye back in the Ross household. Caleb wondered if their last tie was thick or thin. Akiva doesn’t wear ties anymore, while Rob‘s ties tend to be down the middle, leaning toward thinner. Lindsay also wrote in to ask if they’ve seen Firestorm. Akiva noticed there were five of them, and they both believed the intention of the Seinfeld writers was for it to be a fake movie. Travis thought this could be one of the best Elaine episodes, but Robthought the take to be a bit hyperbolic. Max the millennial shared how Susan’s parents and Mabel the rye purchaser were all also on the TV show Twin Peaks. Chester pointed out how Mrs. Ross criticized Mr. Ross for not reading any of the books, but it’s well known he read John Cheever. Next he pointed out how the club which Elaine’s boyfriend performed in actually closed down around this time in real life. He also noted that wine would be a better gift than bread, being that the bread isn’t something to serve plain, and comes off as cheap. He lastly thought George getting caught with the rye on the hook should have made him endearing to the Rosses. Tune in next week as the guys will recap “The Caddy”. Send in your questions by emailing [email protected]. Don’t forget to subscribe to the podcast by going to postshowrecaps.com/seinfeldITunes where you can rate and review the podcast. You can get a discussion going about the podcast by leaving a comment on the show page, and as always, you can follow them on Twitter @robcesternino and @keev26.